In Week One of the Organized Life Series, the goal is to create calendars and schedules for cleaning & maintenance and to develop a weekly schedule. 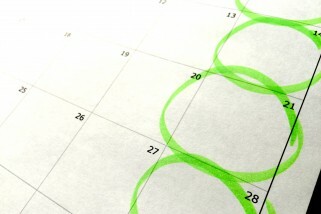 In order to prepare a cleaning and household maintenance calendar, you need to be prepared. This article is intended to supplement the creation of those calendars. Make a list of home maintenance chores for each area of the home and listed by the frequency of the cleaning. You can’t plan out a cleaning schedule until you know what needs to be done. Below is a home maintenance schedule. Most of these tasks apply mainly to homeowners, but renters should have a look at some of the important safety reminders. Take down window screens to store (label them for quickly putting up in the spring, and repair or replace now, if needed). After you wash your windows, replace with storm windows. Seal windows and doors with weatherstripping and also check caulking (you can save as much as 15% on your heating bill, according to This Old House). Replace seals as necessary. Check roof for leaks, damaged or missing shingles, and pests hiding in vents. While you’re up there, check chimney for leaks, bricks and mortar falling apart, and, again, pests. Yard cleanup! Trim trees and shrubs closer than 3 inches from your house. Check your outdoor faucet for leaks, then drain and turn them off. Store hoses. Clean gutters and downspouts. Bob Vila will tell you how. Gutter covers of some kind can also help keep debris out of your gutters. Clean and store patio furniture (or cover with weatherproof material). Check smoke detectors and carbon monoxide detectors, and replace batteries, if needed. Also check fire extinguishers. This is a good time to do fire drills and review your emergency documents. Remove air conditioners or protect with weatherproof cover (if applicable). Check attic for insulation, leaks, hiding squirrels, etc. A simple attic inspection is easy to do when you know what to look for. Bleed radiators if you have hot-water heat. Don’t do this when the system is use, because the water will be hot. DIY Online has some instructions. Vacuum and clean refrigerator coils. Inspect kitchen and bath fixtures and cabinets for leaks, and prevent water damage by recaulking or regrouting countertops and tiles in the kitchen or bathroom as necessary. If you don’t have a contractor yet, you can find one with previously mentioned Angie’s List, though it’s not free, or a site like Service Magic. Professional Cleaning services. Get things like your rugs, carpets, and upholstery cleaned. Wash windows and replace storm windows with screens. Check gutters and downspouts and clean if necessary. Check your deck and fence for water damage or stains. A pressure washer can help rid your deck of mold and moss. Check smoke detectors and carbon monoxide detectors, and replace batteries, if needed. Check basement (or foundation) for cracks or leaks, dampness and mold. Inspect kitchen and bath fixtures and prevent water damage by recaulking or regrouting countertops and tiles in the kitchen or bathroom as necessary. You can access the ready-made calendar and get more scheduling information on the Calendars: #1 in the Organized Life Series page. This article from Lifehacker discusses things such as bicycles, plumbing, home, car and computer repairs and how to do them yourself. I recommend checking it out.